It’s estimated that around 85 per cent of the UAE’s 9.3 million people are immigrants – with many different nationalities and religions represented in the cities and desert across the new nation. There’s a common misconception that the city’s mosques are the only ornate places of worship in Dubai (and Sharjah) – but that’s just simply not true. 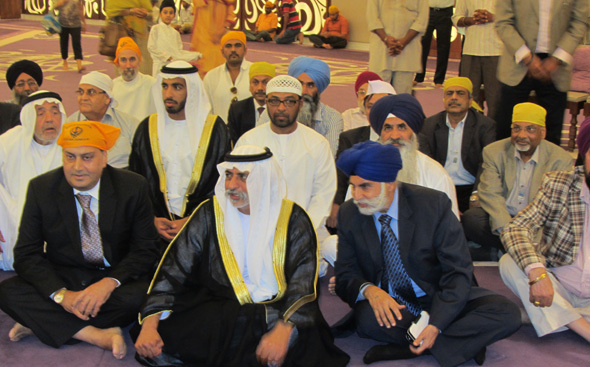 “We officially inaugurated the Gurudwara on January 17 2012. Today, the Gurudwara attracts visitors from across the world: they get surprised that in an Islamic country, there is such an ultra-modern Gurudwara. Fast fact: On April 13 this year, the Sikh temple hosted 101 nationalities for breakfast, winning the Guinness World Record title for ‘Most Nationalities Having A Continental Breakfast’. Ever noticed the marigold garland and Hindu figurine shops in the textile souq right by the Creek? Well, they’re right under Dubai’s Hindu temple. There are separate temples for both Shiva and Krishna in the Bur Dubai spot, and the small space hosts thousands of worshippers each week – and always smells beautifully of sandalwood. The land in the souq was given to the Hindu community of Dubai by Sheikh Rashid bin Saeed Al Maktoum back in 1958 – the site was chosen because the Creek area became the natural home for the country’s Indian population when it was the major trade and commerce artery of the city. Remember, at least 5% of the UAE’s population are Hindu. In 2013, a Muslim businessman donated five acres of land next to a mosque in the capital that will be turned into a large Swaminarayan temple – and in 2015 the UAE’s rulers announced that they will build a large Hindu temple in Abu Dhabi too that will open by the end of this year. The Abu Dhabi temple will host the worshippers of many different faiths, including Buddhism and Jainism. Just across the road from the Iranian Hospital at the end of Al Wasl Road is the Imam Hussein Mosque – which is most often referred to as the Iranian mosque. It was built in 1979 with the help of the Iranian Red Crescent. 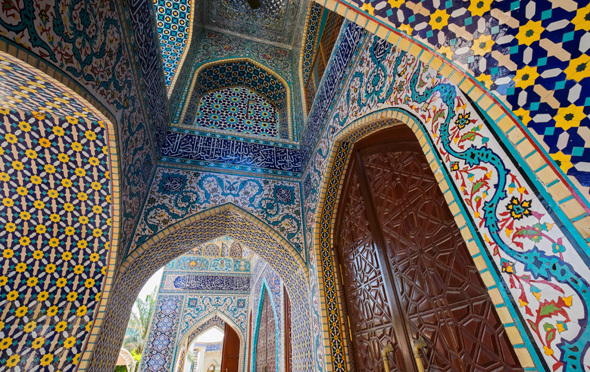 There are around 500,000 Iranians living in the UAE – and this mosque particularly caters to the Shia muslim population. It hosts a library with books in Arabic, Persian, Urdu and English. 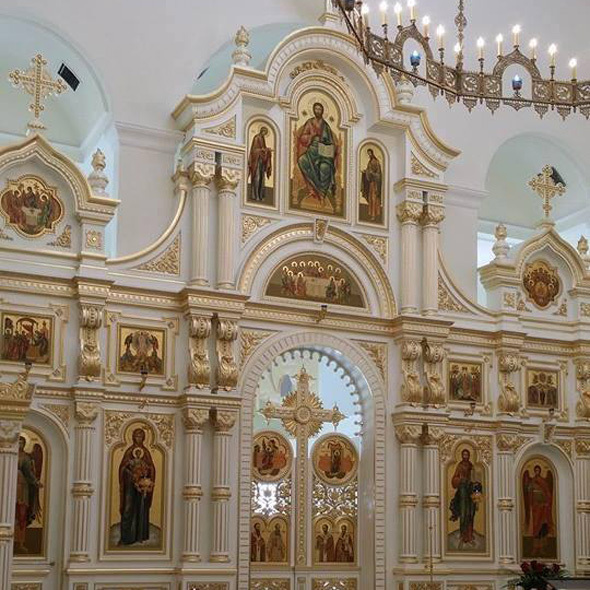 The plot of land this church is built on was gifted to Sharjah’s Russian Orthodox community by H.H. Sheikh Sultan bin Mohammed Al Qasimi, the ruler of Sharjah. It’s the biggest church in the UAE and can cater to up to 20,000 worshippers at any given time. A huge Anglican church is also being built in Abu Dhabi right now. It will be the region’s largest church when finished. 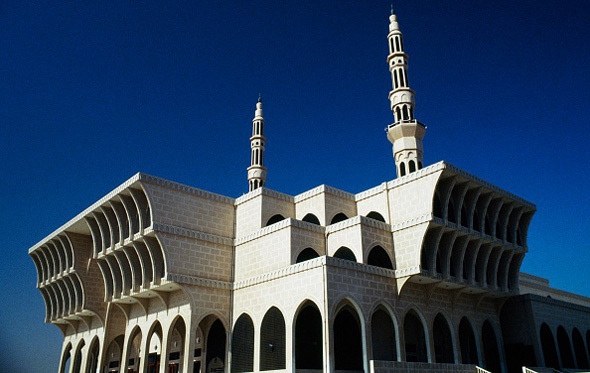 This is the largest Sunni mosque in Sharjah, and is named after King Faisal bin Abdul Aziz Al Saud, the former Ruler of the Kingdom of Saudi Arabia. It’s right in the centre of Sharjah – and the building was constructed 30 years ago, opening its doors in 1987. There are two floors dedicated to a men’s mosque and then a floor for a women’s mosque and a floor dedicated to an Islamic Affairs office. The land for this church was donated to a Roman Catholic mission by Sheikh Rashid back in 1966 – the foundation stone for the building was laid by Sheikh Rashid himself. 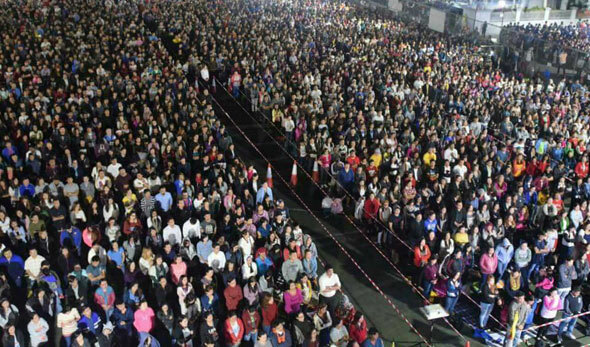 Today there are more than 80,000 Catholics living in Dubai and it’s estimated that ar0und 7,000 people come every Friday for mass. There are dozens of services in all sorts of languages, including English, Arabic, Tagalog, Malayalam, French, Portuguese and Polish. “In this compound we are free to exercise our religious practices,” explains Father Lennie Connully, the Parish priest. Most of the churchgoers come from India and the Philippines. Also, it’s important to note that there are many other churches, mosques and temples across Dubai – the above are just a sample. Video editing and filming: Surajit Dutta. Video and story research: Aarti Saundalkar. Photos: Getty & Supplied.